Bedrooms that are stylish and elegant can also at the same time be bold, bright or romantic. There are numerous ways in which one can stylize Bedroom Interiors and offer a cozy personalized retreat. Modern bedroom interior can be glam, contemporary, bright, minimalistic, romantic or even classic. It all depends on the taste and style of the owner. Glam: If glam is the look you prefer, make sure to keep the surfaces uncluttered and don’t forget to add a combination of rich textures, warm materials and soothing colors. To take it one step further, add a few pools of light fixtures and you gift yourself a perfect escape for a cozy haven of relaxation. The ambiance created by this type of bedroom strikes a perfect balance between elegance and class. Contemporary: A bedroom which is relaxing and tranquil can offer a wonderful getaway. If contemporary bedroom decor is the style which best suits your taste, here’s how you can decorate it. The symmetry of the interior and the décor are the 2 most important details to pay most attention to. Decorate the room by teaming up crisp white linens with monochrome accents. To make this bedroom more “contemporary”, hang floor length curtains on either side of the window frames. Wondering how that’s going to help? It will instantly create the illusion of elevated height and larger windows. Additionally, it also maximizes the light and breeze coming into the room thus making it light and airy. Bright & Colorful: If you want your bedroom to represent your bold and bright personality, then accentuate it by painting the walls bright. A bright yellow wall will immediately bring the interior bang up-to-date, thus freshening the room and bringing the whole space to life. Bright and colorful rooms also bring in with them a happy feel to the room. Add a set of mismatched frames and a chandelier to contrast perfectly with the bold wall giving it oodles of personality and character. Minimalist: If you are a firm believer in the ‘tidy home, tidy mind’ spirit, then you will certainly feel at home with minimal spaces. The mantra of a minimalistic bedroom décor is having only essential furniture and bright white walls to make the most of light. Throw in some contrasting beddings and rugs to add vibrancy to the room. Romantic: To create the perfect romantic bedroom décor, the first thing which needs to be done is to get rid of your existing furniture and make room for a bed with clean lines. Elegant bedding is the perfect companion for a romantic bedroom interior. Finally, add a mix of warm colors, solid furniture and infuse your favorite fragrance to give your room a touch of romance. Classic: Refined elegance is what sets a classic bedroom décor apart from the herd. Choose simple color palettes if you plan a classic décor for your bedroom. A combination of blue and grey makes for a wonderfully subtle master bedroom. This design is about artistry and sophistication. Add boldly ornate décor pieces like a chandelier and combine with pastels to render your bedroom a classic unique look. Transform your bedroom into a stylish haven with these Modern Bedroom Décor Ideas. Home décor experts from Mobel are all about providing easy yet stunning DIY projects to spruce up you home without spending too much money. Dig into our unique and amazing DIY projects library for interesting ways to infuse personality into your home. 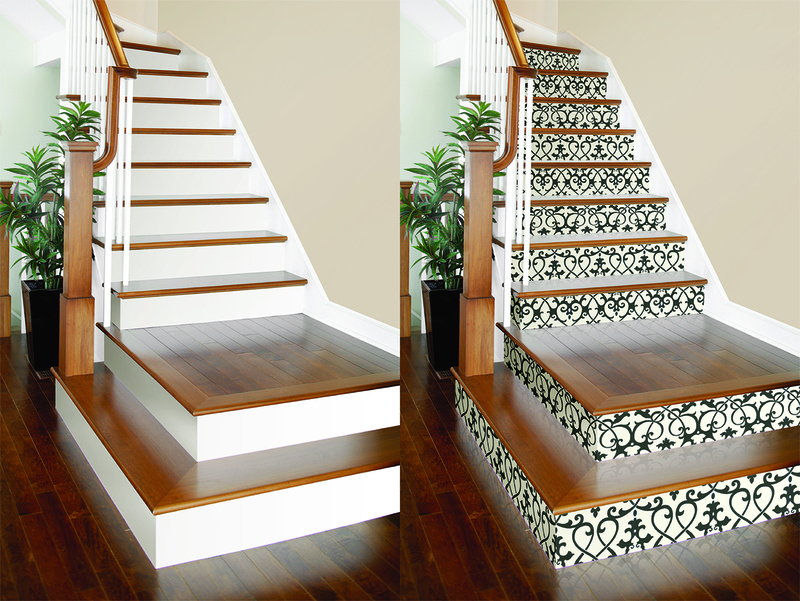 Give your home a complete facelift by adding gorgeous wallpapers to the stair risers. It is one of the easiest ways to enhance the interior of your home and create an eye-catching centerpiece. Plain white lampshades when given a personal touch, offers a unique alternative to the sea of plain lampshades found out there in the mass market! Add a paper design of your choice to the inner lining of the plain lampshade or simply draw a design on the outer surface to give your bedroom or living room an artful treat. Did you ever think that mason jars can be amazing elements to add charm to any window? Well, they do. They beautifully dress up your windows and make them look good. So, you see, you don’t need to burn a hole in your pocket to bring home beautiful window treatments. 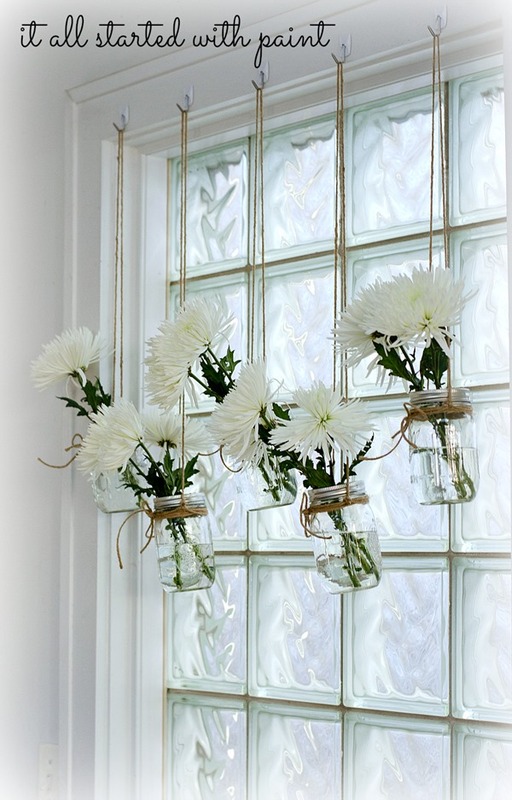 Add candles or flowers to the mason jars and hang them from the top of the window by using some command hook and jute. Pair marker with a stencil and give new look to fabrics. 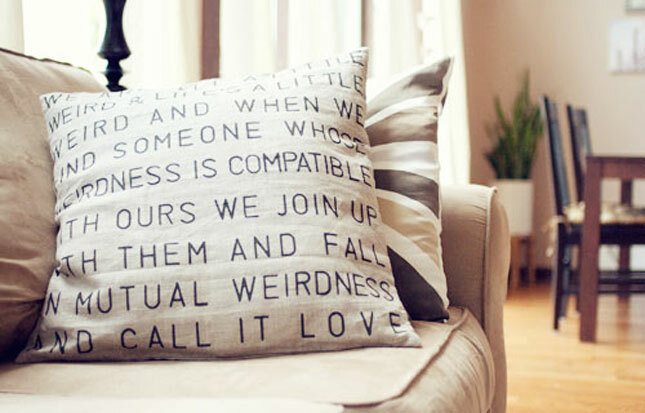 Use them to stencil your favorite quote on pillow cover, table runner, cloth napkin- basically anything you can think of! When you have stenciled the quote on the fabric, leave it to dry for a couple of hours. Finally, press the fabric before washing to prevent any ink bleeding. Regular picture frames can be found everywhere, try something new. Take your favorite photos and display them inside unusual-shaped bottles. Get hold of some pretty tiny shells, some decorative beads or colored sand and place them in the bottom of each bottle. Next, roll up the photo and slide it inside the bottle. Finally, seal the bottle with a fancy cork and some pretty trinkets. Window blinds are practical and effective solutions to light control and privacy, but cleaning them properly can be a herculean task. Dust easily gathers on blinds just as it settles on an other surface, but with Mobel’s helpful tips and tricks, you can easily take away the stress of cleaning your window blinds. Venetian Blinds: The horizontal slats on the Venetian blinds gather dust easily. Because of this, the Venetian blinds can at times be off-putting. In spite of all this, there is an easy solution to the weekly cleaning of the blinds which will take very little of your time. There are two simple ways of getting it done. First, keep the blinds open so that the slats are parallel to each other. Take a piece of an old cloth or a duster and gently wipe across each slat to remove the dust. Second, if your vacuum cleaner has an upholstery tool or attachment, you can use it to gently clean the slats without even opening the blinds. But while doing so make sure that the suction power of the vacuum is turned low so that you accidentally don’t pull the slats out of shape. Vertical Blinds: Unlike the Venetian blinds, these window blinds doesn’t require a huge amount of cleaning. For weekly cleaning of the blinds, close the blinds so that all the slats flatten out making the surface uniform for cleaning. You can then easily wipe the flattened slats with a soft cloth or duster. But remember, while doing so don’t exert much force on the blinds lest they bend or break. When you are done cleaning one side, simply flip the blinds rounds and repeat the process. It is recommended that you go for a deeper cleaning once every year. To do so, simply leave the blinds soaked in mild detergent for 10-15mins and then wash them under running water. Dry them outdoors. That way you can dry the vertical blinds without marking or creasing. Roller Blinds: Another kind of blinds which is relatively easier to clean is the Roller blinds. Before picking up that duster, roll the blind all the way down and then gently wipe them using the duster or simply with a piece of cloth. Sometimes you tend to stain your blinds, but you can easily get rid of those stains by dabbing in some gentle liquid detergent on the affected area. Damp a cloth and wash the detergent off. But before doing so, check with your supplier if the type of fabric used for the blind, supports washing liquid. Now you know that cleaning window blinds is not that difficult, right? And if you are looking for new window blinds, drop by at Mobel Furniture and browse through a wide variety of beautiful window blinds. Thanks for reading. Come back for more tips, tricks and the latest trends in home decor. 8 Top 5 Curtain and Blind Styles to Choose From! Curtains, shades, blinds and all kinds of window Treatments are undoubtedly one of the most important elements of Interior Design. They hold and blend the colour schemes used in the décor, set the tone of the room and also go on to create a bold style statement if done up right. In some cases, they are also used as primary accents that build the character of the entire room layout and décor. But in order to achieve that, one needs to know the various types of curtains, shades and blind stylesso that one knows exactly which to choose for making your room look good to glam! Cafe Curtains: This curtain style includes covering only the bottom half of a window. In some cases it is paired with a valence (drapery style on the top part of a window) for a stylish and different look to a room. Sheer Curtains: A style that we all love, the translucent fabric that gives a stylish and chic look to your room. It filters light, provides a certain amount of privacy and is often combined with heavy fabric drapery for ornate interior designs. Lace Curtains: This gives the same effect as the sheer curtains with the exception that these are made from lace fabric. Gathered Curtains: This style involves using curtain and drapes that are pulled up half their heights and are tied to the sides. Bishop Sleeve Curtains: These types of curtains are very much trending and involves having vertical panels of the curtain where it is pinched up at regular intervals to get a series of blousy sections followed by a gathered pleat. Balloon: This refers to the old stage curtain style where series of draw strings hang vertically across d width of the window, that gathers up the material when pulled. Festoon style or the ‘London shade’ is similar to the Balloon with the exception that both the edges on the two sides are not gathered. Hence, Balloon gives a semi circle look while Festoon gives d style a tail. Cellular: This style involves a crisply pleated fabric shade that folds up neatly together when drawn. Basically in this style, the shade is made into a honeycomb providing insulation to a certain extent since pockets of air are held in between the honeycomb structure. Roman: The Roman shade is a chic style where the shade creates a flat panel when closed. The folds are spaced and occur at regular intervals and overlap each other when they are drawn up. Roller: This style consists of a simple and flat shade which can be pulled down at any height and again rolls up to the roller at the top when it is drawn. Blinds: These refer to shades made out of wood, metal, plastic or fabric that remains suspended in a string mesh. When drawn up, the entire treatment goes out of ones view. Posted on April 17, 2015 Categories Interior DesigningTags curtains, home interior design, interior design, interior design idea, modern look to your homeLeave a comment on 8 Top 5 Curtain and Blind Styles to Choose From!